Just back from an organizational meeting for the picnic on Monday, Dec. 27. People will be meeting at Restaurant Cato in La Manzanilla at 10 AM. Boats will take people to Tenacatita beach. All the boats leave at the same time, so there will be a mass landing of at least 150 people. Several diputados are planning to attend as well as media people (reporters for radio, newspapers and tv). We'll be bringing tacos and agua fresca, but everyone should plan to bring their own water and something to eat. Some tarps will be set up for shade and there will be a band, to add to the festivities. This is an adults only, peaceful picnic. Remember: NO ALCOHOLIC BEVERAGES! As many of you know, the Jalisco state government, along with the Rodenas corporation violently grabbed Tenacatita this past August 4th ousting villagers, land owners, and tourists from their restaurants, homes, and palapas and blocking the federal highway that leads to Tenacatita. For months we have waited patiently for a resolution to this blatant injustice where a powerful businessman committed crimes against the townspeople of Rebalsito and was able to rob every Mexican of his constitutional rights by not letting people pass freely through a federal road and by not letting them land on the beach in a clear violation of Mexican constitutional law. I am writing to invite you to a peaceful picnic at Tenacatita (fully supported by Rebalsito's town leaders) this December 27 at 9 AM starting from the town of Rebalsito. We will be entering Tenacatita through a back way and will be ferrying the public across a narrow stretch of the lagoon in undisputed territory and then march up the beach for a final gathering up by the restaurants. If the beach is open by then we will march up the road. People wishing to arrive by sea can join us. Foreigners who are a little apprehensive can show support by being in the bay with their boats. All levels of the government are aware of the problem and yet gross civil rights violations are allowed to continue. They promised that they would open the beach by Christmas to allow the villagers to be able to sell some things on the beach to help alleviate the stranglehold poverty now has on this village. The concession of opening the beach, even if it did happen, is more of a slap in the face than anything else since there will be no camping, people will only be able to sell things out of carts, and there is no infrastructure like bathrooms now that they have leveled them with heavy machinery. I can't imagine anyone will want to come from very far if you can only be there during the day. Useless if you are from Guadalajara. This move is just propaganda to say it is open. The conditions cripple any possible step forward. On another front, ecological and cultural problems at the beach are intensifying. We have received credible reports of mass baby turtle deaths and while Rodenas is probably not responsible for causing them directly, they are not permitting the usual people who protect these hatcheries every year to do their job. Americans visiting Rebalsito also discovered a second ecological tragedy and were able to take photographs. They described a dead cow with over thirty dead vultures around it on the road where the old airport was. It isn't clear if the guards shot these animals or if they poisoned them but the massacre of dozens of these important animals is an ominous sign of the Rodenas style of wildlife management. The locals would never hurt these birds because they have no food value and because they understand that the removal of carrion is critical for the towns' health. Another dramatic development is that after all of Villalobos' talk about how the restaurants were polluting the region, his own guards are going to the bathroom outside after managing the hotel's septic tank system proved too challenging for them. On the cultural front. The people of Rebalsito set off a couple of days ago on their annual march with the Virgin Mary which starts at the church of Rebalsito and ends at the beach for the important blessings that she bestows upon the vessels and people. This year she got to the gate flanked by a peaceful group that included many children. The procession was stopped at the gate and not allowed to enter in a move that is low even for Villalobos. Meanwhile in Rebalsito, a dedicated team of foreigners with Tenacatita in their hearts is continuing to work with the locals to provide staple food supplies to those most affected by the beach closure. We are inviting the general public to peacefully assemble in Rebalsito on December 27 by 9 AM. I know that foreigners are a little apprehensive about these sorts of things but this is really important and it could be your rights that someone chooses to take next. If you don't want to land fine but please join us in your boat or donate to the cause. If the beach is opened, we would all meet at 9 AM in Rebalsito anyway and march down the road to Tenacatita. We have to make sure that Tenacatita stays in the national spotlight. I will be arriving in the area next week and will be working on bringing the voices of the people to the media in English and Spanish and will be pushing this important issue into the United States media. Please participate. I know we can reverse this injustice, we just need your help. I will be sending another letter as the date gets closer with more details. 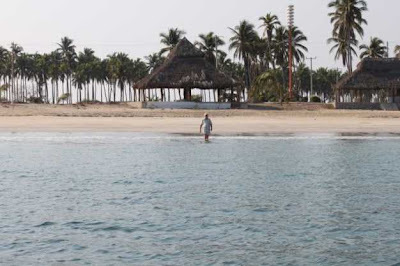 In yesterday's Jornada article it says that Villalobos "could" sign the agreement this week, (which would open the beach, but with many conditions) and then he would have 5 days to get his guys out of there, or at least only on his supposed 42.5 hectares. But the conditions include days use only, no camping, no one can build palapas or open restaurants, only vendedores ambulantes (with permits, of course). Doesn't sound much like free access to me. Most people here think it's unacceptable; others feel like it's a first step.